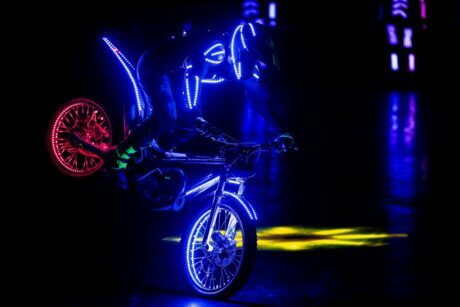 BIRMINGHAM, UK – The all-new Moto Cirque show, a creation of pioneering show originators Arena Sports Live, debuted last November at the NEC Birmingham, surrounded by 2,000 motorcycle spectators who got a first-hand view of a high-tech, intensely choreographed street bike stunts, BMX, trial, freestyle motocross, mixed with a lighting show, lasers and overall theatrical performances. 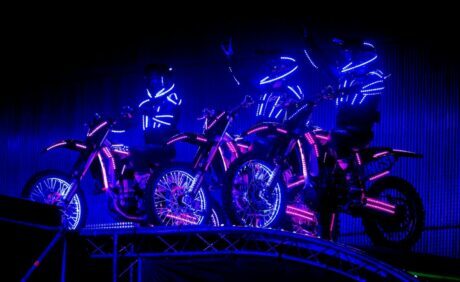 Behind the LED integration into the FMX bikes was the UK-based Shock FX, who headed up system design and fitting lighting, drivers, and wireless receivers. “We used a total of 28x Micro R-512 G5 receivers, all connected to a single BlackBox F-1 G5 transmitter, located at front-of-house”, said David Taylor, CEO of Shock FX. “There was a receiver on the bike’s frame, another one on the rider’s suit and a further two on each wheel so they could both have free movement”. This type of event is a usual diet for David and his team: “We get involved with a lot of bespoke events, and Wireless is something that always helps the stuntmen. Thanks to these receivers and LiPo batteries installed on the bikes, the riders can perform all the tricks live in the arena, which include sailing 10 meters over the ground”, commented Taylor. James Walton, who’s also no stranger to W-DMX™ added: “We are very familiar with the W-DMX™ system and what it takes to make it all running fairly quickly – thankfully, there is actually not much configuration we need to make, once we linked the receivers, the time-consuming part was ensuring a robust fit perfect for the riders to ensure their balance would not be thrown mid-air”, says Walton. The event was programmed on a HES Full Boar Hog4 by Elliot Mountford with the main lighting rig was provided by HSL.